I thought that the things that caused fear to stir up panic in me had changed over the years and some of them have. Others? Not so much. I can remember, vividly, the first time I saw THE WIZZARD OF OZ. I was three years old and that darn witch was SCARY! I had to go to the bathroom but, in order to get there, I had to walk halfway down our long hallway. In the dark. I was so scared by the time I reached the bathroom, I forgot to pull down my pajama bottoms before I sat down! I often wonder if the Wicked Witch of the West was the reason for my recurring dream of a witch. In my dream the witch lived in the house next to my grandmother and granddaddy’s house. She would seem so sweet and invite me in for a snack and I went. Every. Single. Time. Inside, there would be this HUGE pot simmering on her stove and I knew she was planning on cooking up some little kid for dinner. ME! (A little Hansel and Gretel influence here?). I would try to get out but she would start tickling me (I really hated to be tickled when I was a kid…actually, I still hate it) and I would become very weak from laughter. That’s when I woke up. Every. Single. Time. I’m not really afraid of witches now. Not really. Although, I am certain that the witches in HOCUS POCUS would have scared me silly when I was a kid! 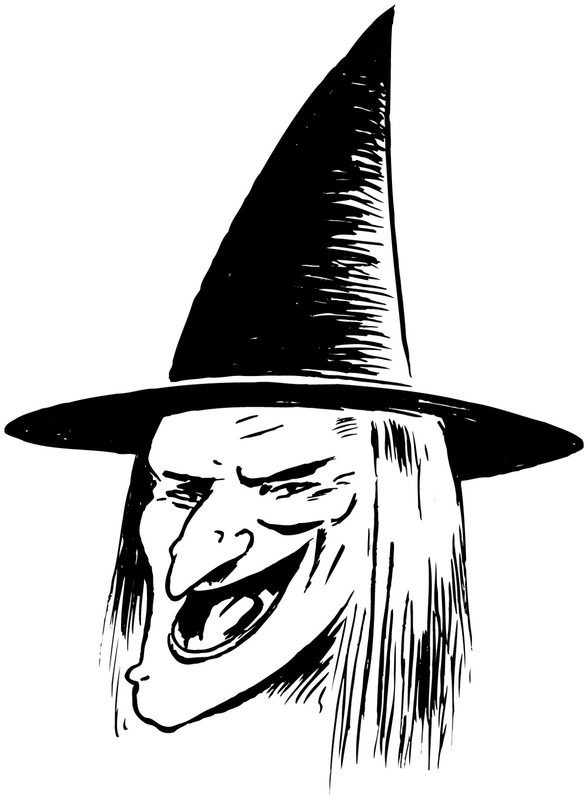 My fear of witches followed me throughout my childhood but not really into adulthood. I almost certain of it. Engine Number 12 still running. My fear of trains has followed me from yet another childhood experience. This fear first reared its ugly head at Tweetsie Railroad. 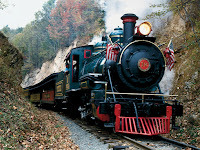 Tweetsie is a Wild West theme park in Blowing Rock, NC. When I was a kid my hero was Fred Kirby. Fred was a rootin’ tootin’ singin’ cowboy whom I ADORED. Looking back, I have no idea why except that he was such a gentle soul who loved kids. He hosted a television show on Sundays on which he sang, joked around with Uncle Jim, and showed episodes of THE LITTLE RASCALS. I tolerated the showing of THE LITTLE RASCALS only because I knew Fred Kirby would be back on when it was over. But best of all---his hang out was Tweetsie Railroad. And we were going. And HE was there. O!M!G! Our first outing to Tweetsie was relatively uneventful. Except for when my parents realized that I was MIA. I had spotted Fred Kirby and gone straight over to where he was just as fast as my three-year-old legs could carry me. Somehow, this part of the memory fails me (maybe it was my cowgirl boots and outfit), I ended up on Fred Kirby’s shoulders just as happy as I could possibly be. This is how my parents spotted me. My next memory of going to Tweetsie (and my absolute last until I was an adult with children) was quite eventful to me. This time, we were going to ride the train. Very EXCITING! My dad, NeighborBeth, her dad and I got on board. 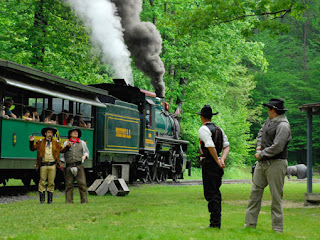 Now, the train at Tweetsie is an old steam engine and it’s rather LOUD so the sound alone made for a bit of nervousness. Just a bit. Unbeknownst to me and NeighborBeth, somewhere along the train route, a group of Indians and train robbers were going to rob the train. That’s right. Rob the train. We heard some loud pops and looked all around because the train was slowing way down. Then it stopped. WTH?! When those Indians and robbers boarded the train in all their Wild West attire wildly waving their guns and tomahawks around in the air, NeighborBeth and I grabbed our dads around their necks and nothingnobodynohownoway could tear our death grips from around them. 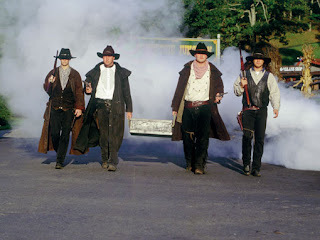 (You must realize here that the only Wild West experience I had had prior to the trauma was purely Hollywood portrayals.). The dads couldn’t even pry us loose because they were so weak from laughing so hard. Attention: THIS WAS NOT FUNNY-justsoyaknow. We didn’t loosen our grips until we got off that train and I have NEVER ridden on that damn thing again. EVER. Not even with our kids who totally enjoyed themselves when they were there- go figure (of course they were older than I was when I was taken to that place and they also possessed more knowledge of Native Americans than what Hollywood had to offer--although even Hollywood had changed their portrayals by then.). To add insult to injury, we stopped to eat at a seafood place on the way home from Tweetsie that day. My parents heard that it was a fun place for kids with a huge play area and the front looked like a huge Pirate ship. NeighborBeth and I were somewhat calmed down from our train trauma and were sitting at our table waiting to order. Now, what character do you think they had at this seafood place, that was so much fun for kids, who walked around visiting tables? A Pirate you say? Why yes indeed. And he walked right up to our table and proceeded to speak his Pirate speak and reach out to cut off our pony tails. Oh yes. Insult to injury. These pictures are on the Tweetsie website...just click the pictures if you want to see more. Only three fears remain- snakes, heights and closed in spaces-and I really can’t trace them back to any specific event. With the possible exception of the time that girl chased me with a green snake all over the pool locker rooms. Oh yeah, that was fun. And by fun I mean HELLNOITWASNOTFUN (just in case the sarcasm wasn’t obvious). I still remember that day vividly as well. All I’m really left with are these memories, the fears and the hope that KARMA stepped in and did her job on these people. Why, yes, (in case you're wondering) I AM most definitely including my parents in this. Especially the one who was laughing at Tweetsie. Today is the 8th day of NaBloPoMo (National Blog Posting Month) for the month of March. Our theme for the month is: in a word. I am using the word FEAR today even though it was inspired by yesterday’s prompt: What's one thing that scares you right now, and why should you make a real effort to face that fear and do it anyway? Although, it could be somewhat related to today’s prompt: Do you have a good memory for some things and not others? Oh and I won’t be facing those fears. I’m just fine staying away from trains, heights, closed spaces and snakes. And I’m NOT scared of witches anymore. Really. I’m not. That would definitely be enough to scare the crap out of a kid. Poor you. Rosemary- I'm hopping over to your blog to see if you put up pictures of those waves---YIKES! Poor you - it looks like you had a series of randon 'kid scaring' experiences which affected you for life. It made a funny post though! Heights I know why I'm afraid of them, try cleaning windows on the outside of a house, 3rd story and the ladder collapses and your sister, instead of making sure you're okay, laughs at your while you mom is trying to pick you up broken and bleeding. Closed space....not going to happen. I can't even close the door of our bathroom in the camper. Nope, nada, not going to happen. I love this NaBloPlMo. It has been so fun reading your posts. Take care Pam and have a blessed evening. Love, love, love Blowing Rock!! We used to live in Winston Salem and would visit there often. And I have very fond memories of Tweetsie Railroad. One of my fears is rollercoasters and Tweetsie's is the only one I'll ride! Julie- Shooting witches? LOL Thanks so much! Beverly- I love Winston Salem. My aunt wrote her dissertation on Old Salem! Beautiful up there. Now this is crazy, I know you'll think so too, as I do. But I have a fear of heights. I can NOT get up on a roof without freezing and moving not a muscle 'til I'm rescued. But the ironic part is, I love to fly in a plane. Go figure.